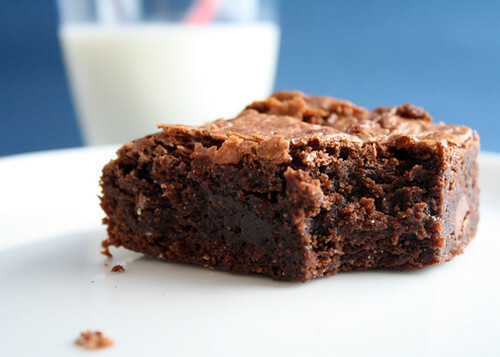 I have been making this brownie for over a decade. After school I'd visit the kids across the road and their mum was always at home making them treats. Years later in highschool they moved back to New Zealand and I lost my afternoon sugar hit (and babysitting money!) but luckily I had copied down this recipe and a few of my other favourites like Hokey Pokey and Chocolate Chip Cookies. This marshmallow brownie was always my favourite. Dense, chocolatey and fudgy without being too rich and the chewy melted marshmallows made it all the bit sweeter. The fabulous thing about this recipe is that you can substitute the gluten free marshmallows for a cup of your favourite chopped nuts or a cup of mixed white milk and dark chocolate bits. 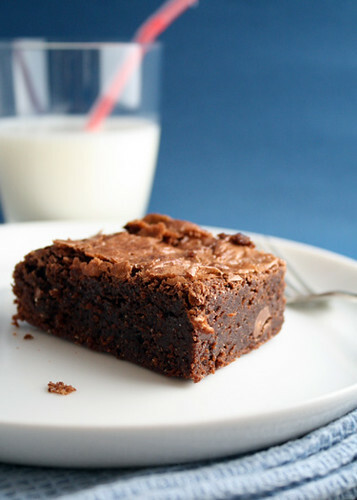 I recommend making this brownie a day ahead as the depth of flavour and fudginess increases! * If you don't have these gluten free flours on hand substitute the one or all of the three flours for 1cup of your favourite gluten free flour blend. Preheat oven to 170degrees Celcius and line an 18cm x 26cm lamington tray. Melt the butter and chocolate together over low heat or in the microwave and allow to cool. Whisk together the sugar, vanilla and eggs until fluffy. Whisk the cooled chocolate mixture into the eggs. Sift the flours and cocoa on top of the egg and chocolate mixture and fold in. Once combined add marshmallows. Do Not over beat this mixture or you will have tough brownies! Pour mixture into a lined lamington tray and bake for 30-35minutes. Enjoy and unfortunately there was no-one in need of a double pass for the Brisbane Gluten Free Food Show so there were no winners! After a long breakfast at midday and I'm sure a long hot bath, she came around and we made Gluten Free Brownie, altered to be Lactose Free for her as a 'well done you're fabulous for running so bloody far!'. Needless to say this went down pretty well. Place the butter, sugar and chocolate in a small pot, over a low heat stir until melted and dissolved. Do not boil. Allow to cool. Sift together the cocoa, flour and baking powder. Add the chopped nuts and mix. Add the cooled chocolate mixture and eggs. Mix until just combined. Do not over beat. Line a 28 x 18 cm tin with baking paper. Bake at 180Deg C for 30-35minutes. Leave to cool in tin for 10minutes. Carefully remove from tin and cool on rack. Serve warm with ice cream or cream. Luckily half of this brownie is going to friend who is celebrating his 30th his wife, an old friend of mine, made me my first Gluten Free Brownie a couple of years ago. That particular brownie was such a hit at our Australia Day Celebrations (held in a very un-Australian way of staying indoors ALL day due to the extreme heat that was burning down that day! )that I do believe that he didn't get any due to his absence when it was taken out of the oven and eaten as soon as it was 'cool' enough to not burn our mouths! So, this brownie post, and the little box above, is for him; Happy 30th Birthday! Chocolate Brownie with Nuts - Gluten Free of course! Melt chocolate and allow to cool. Cream butter and sugar until light and fluffy. Add eggs, one at a time, beating well between each addition. Chop nuts and sprinkle over 24cm square, lined cake tin. Pour and smooth mixture over the top and bake in 170C oven for 40minutes. Allow to cool in tin for 10minutes before removing and cooling on rack. I highly recommend this is served just slightly warm with a big scoop of vanilla ice cream.